Today also happens to be my birthday, which I realized when I had pre-scheduled for this event a few weeks ago. Figured what gift is better than hearing the growl of your 4.0-liter V8 twin-turbo growl in front of you as it puts down some wicked horsepower and torque figures, right? When I arrived there was a gorgeous black B5 Audi S4 finishing up on the rollers, who put down a very respectable pull of around 400 AWHP as I recall. 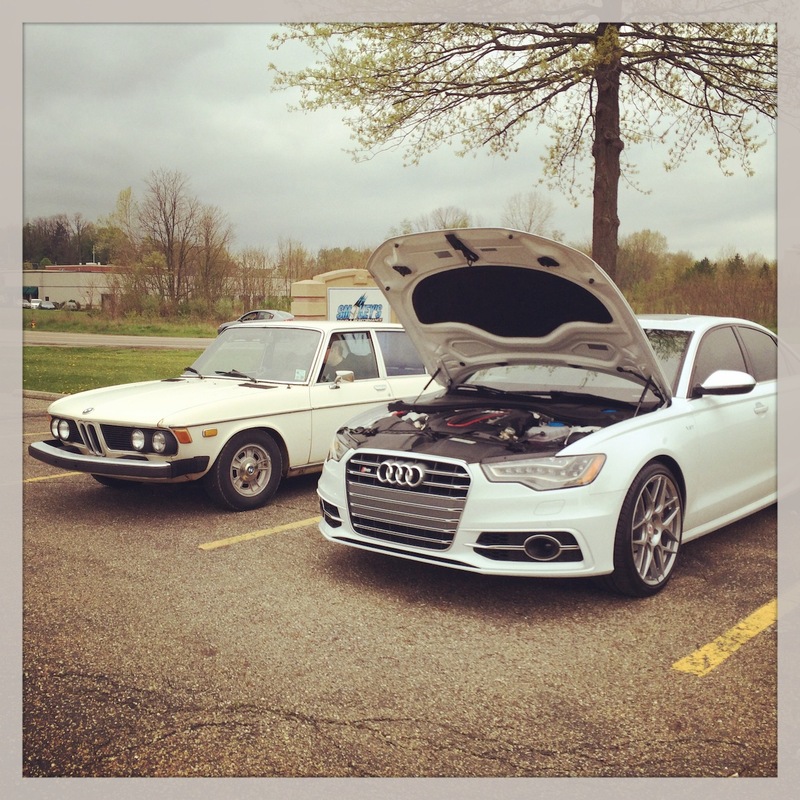 Twin-turbos for the win! While I waited patiently the Mazda club showed up that was running today. This older school BMW (shown above) also arrived, and I’m told his car was hitting the dyno later! Finally my turn arrived around 9:00 AM (my scheduled time), and the staff of Smokey’s was VERY professional (kudos to the entire staff!). Shown above they backed the car carefully onto the in-ground dyno, strapped it in place, opened the rear garage door for exhaust and air flow, and put the fan in place. Finally it was time to calibrate the system for my car. Above is the video then of my third and final run. When provided with the data from the staff at Smokey’s I was told that their dyno tends to test a little “low” so they provided me two sheets, one STP-version from their STP-brand dyno, but another adjusted to match Dynojet figures. For sake of Internet discussions I am using the latter, as it should better allow for real-world comparisons to other people’s results. Above are the final results. Maximum power at the wheels is 499 horsepower, with 474 pound-feet (lb-ft) of torque. Again these are “Dynojet” figures– so the numbers are roughly 5% higher (adjustment by Smokey’s) from the other sheet they gave me. Take that as you will. 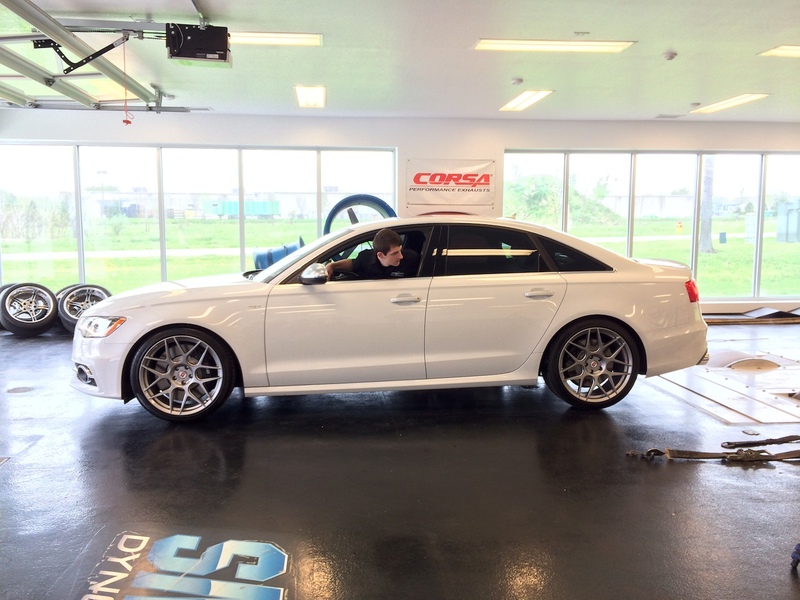 Modifications to the car include the APR Tuning 93-octane program and the AWE Tuning Touring exhaust, which combined to increase stock power quite nicely. I’m quite pleased with these figures as they seem for the most part to match what others have seen. Compared to APR’s claim of all-wheel power being 478 HP / 536 TQ, these figures seem pretty spot on. I’m guessing the torque may be slightly lower being 3rd vs 4th gear but that is uncertain. Never the less they are close enough to make me happy. And you can see the AF data shows they don’t pull timing till very high up, so the car could be even more of a beast if it was tuned more aggressively. Needless to say I was smiling! DISCLAIMER: Since a few people are likely to ask, I’m adding this info. 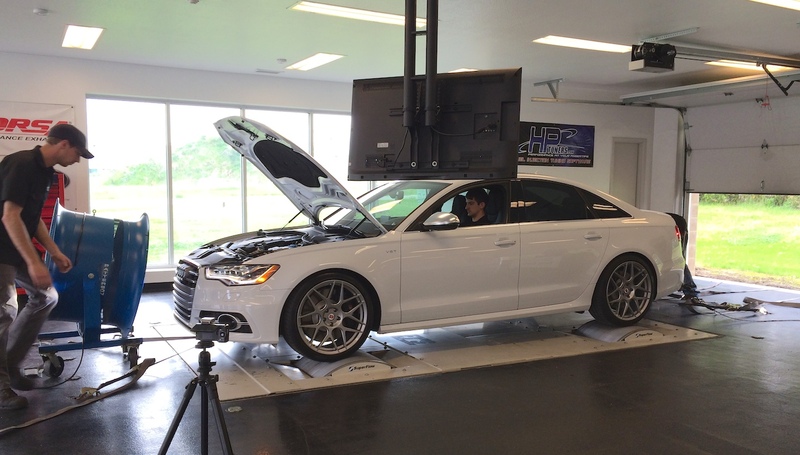 The dyno used at this shop is a SuperFlow unit. 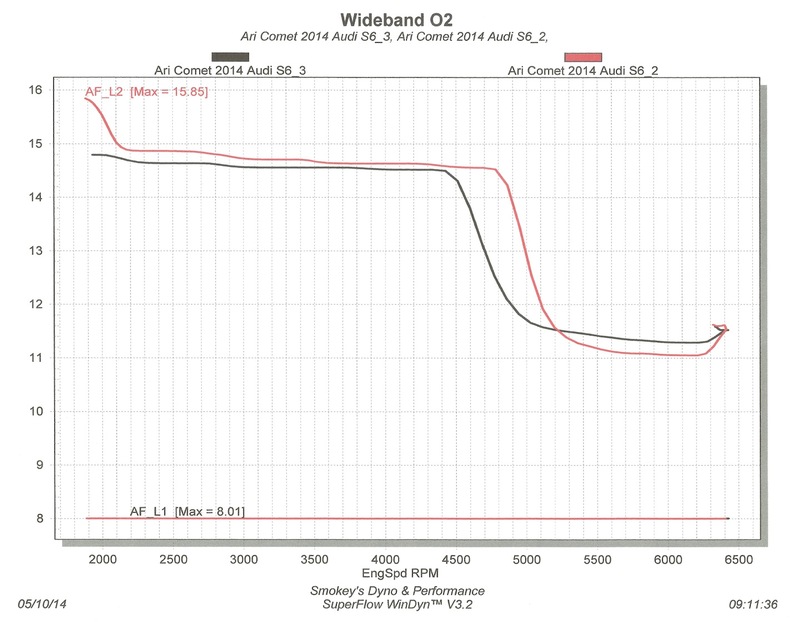 The printout not shown here is the same graph but with numbers that were 475.4 HP and 452.2 TQ at the wheels. 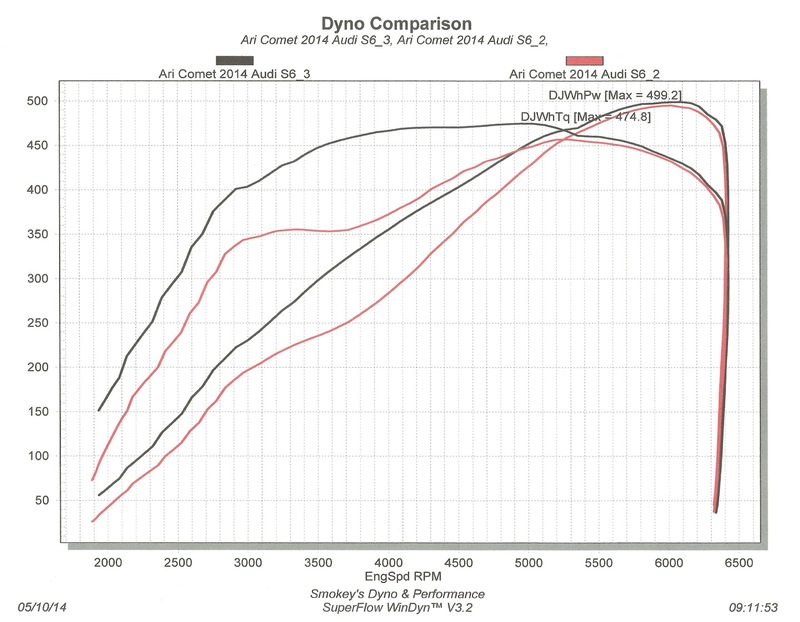 In comparison to the 499.2 HP and 474.8 TQ adjusted (Dynojet) the variation between them is 5% — so it appears they just key in a 5% increase and printed that out for me. Again take these figures however you want, and keep in mind a 4th gear pull would have probably been more accurate. 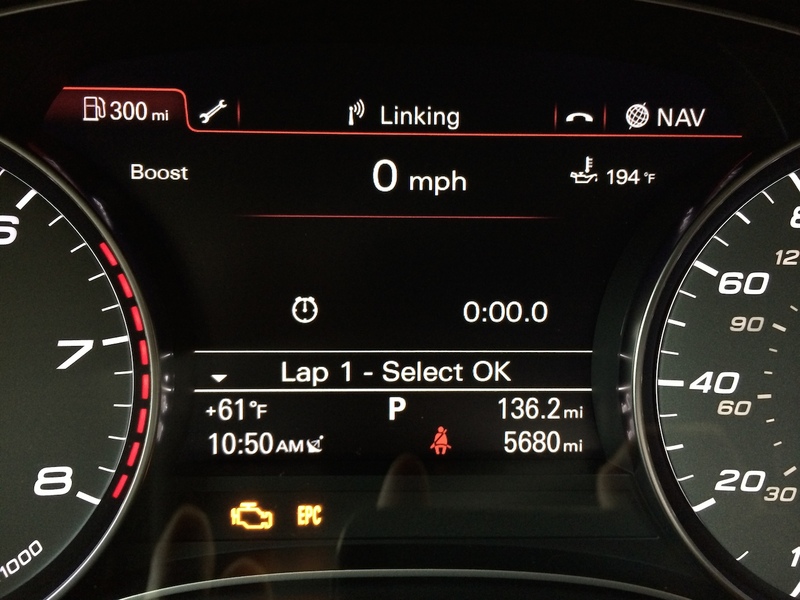 During my initial review of the S6 there had been mention that I would revisit some of the technology on this car. At that time I didn’t have my T-Mobile SIM card so some of the online features were not yet in place. Since I’ve put on over 2,000 miles since picking the car up less than a month ago it seemed it was finally time to honor that promise. Thanks to detailed forum posts like THIS ONE you can learn how to turn on many of the special hidden gems of the car’s MMI system. The first photo above shows the Lap Timer page, which easily provides access to, you guess it, a lap timer. But beyond that you also have oil temperature visibility, which is very nice. There is a pretty boost “gauge” though it is nothing more than a bar that moves up/down — would be nice if it had real data. Secondly was just a photo to show you something that makes me laugh. When you are existing a freeway with a variety of “keep rights” or turn-right needs there after you get these crazy blue snaking lines as shown above. 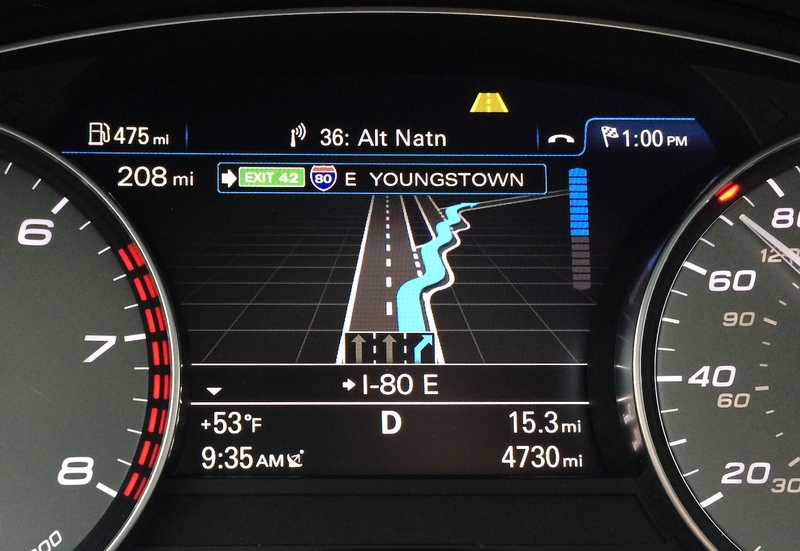 Frankly I think Audi could have done better, and the navigation software is nice (the redundant display in the cluster is much appreciated) but I’ve seen aftermarket navigations do this better. I’d dare say Google Maps for most any device still reigns supreme for simplicity and data. I do like the lane indicator on the map, showing you which lane(s) you should be in. Lastly of the images above is the energy data. This seems more befitting of my wife’s EV (Nissan Leaf), but I guess it is a good/friendly reminder that running your A/C on full blast will negatively effect your gas mileage. 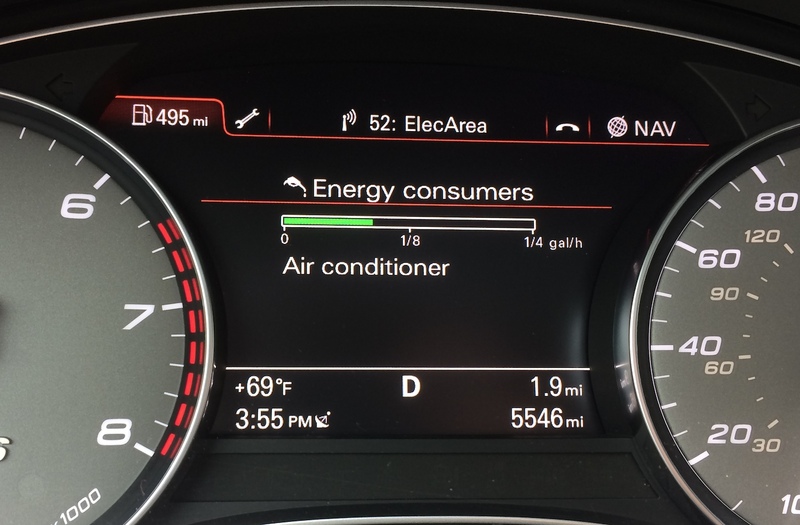 I’m not sure people driving this car really care THAT much about MPGs — but it is cool. If you want to track my MPG progress check out my Fuelly page HERE. Not pictured here but worth mentioning is the online Google features that I can now enjoy. Online points of interest searching is great, though I find the interface remains a bit clunky. Same could be said for the Google aerial view, which is more a gimmick to me than anything. The Google Street View feature is nice to help you find your location, though the lack of a touch screen with pinch-to-zoom features makes using it very difficult. Overall I’d rate it all out of 5-stars like this: online point-of-interest searching gets 5-stars for usefulness, but only 3-stars for interface. Aerial view and street view on the maps gets 3-stars for usefulness, and 1-star for interface. In truth the way that I see myself using the online features in the future will be that I can send addresses to my car from my phone/computer, pre-loading my day’s trips more easily. And I could see using the online search for gas prices or local shops when in a travel/trip setting but even then the phone interface is still so much better. Audi needs to rethink their 4-corner-based interface if you ask me. It lacks the ease I think it should have. Little details on this car, like the illuminated door sills (Shown above) make it a special treat every time you get in and out of the car. Adaptive cruise is wonderful for long drives, and the surround-view cameras make parking this car in any setting a cinch. There isn’t much to say about this car that doesn’t sing praise, and you’ll find that is the case in most reviews. Short of a Porsche Panamera Turbo, a BMW M5/M6 or even Audi’s own RS7, there isn’t much up from here. And for now, I’m more than content with this amazing, VERY powerful piece of hardware. Happy birthday to me, indeed! PS: I’ve had a few people notice the phone cradle in my car and ask me what the story is there. There is a company called ProClip USA that sells the hardware. 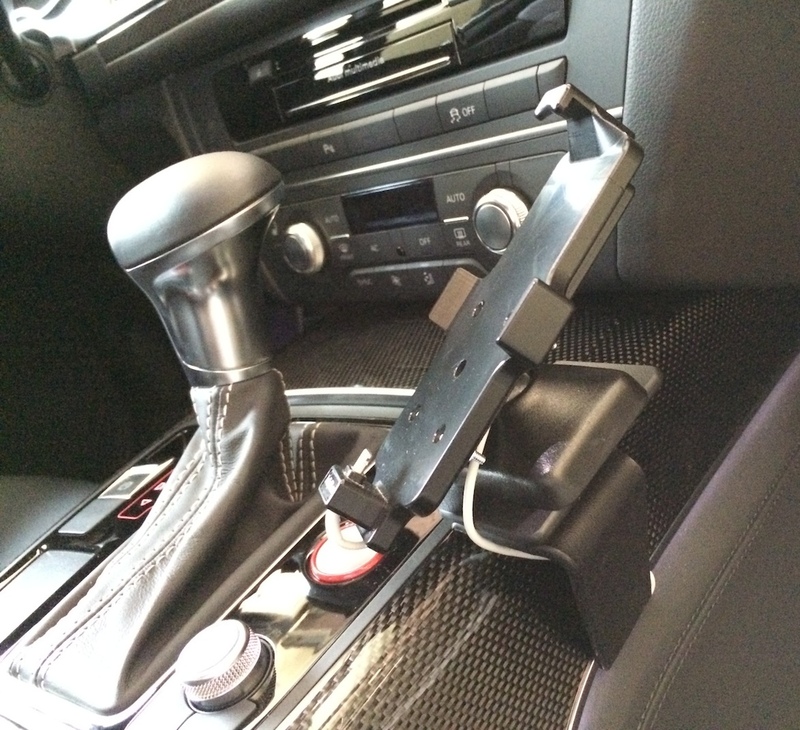 You find a mount specific to your car (usually you have a few mounting location options), and then you find a mount specific for your phone. You attach the base to your car, custom molded for your vehicle. Then you attach the phone-specific cradle to that. My iPhone 5/5S setup is shown below — it isn’t cheap, but it works VERY nicely, especially once you tuck the cable like I did!